The Phoenix probe that was sent to Mars has had its mission extended. Part of Phoenix’s mission was to chemically analyze soil samples, and to confirm the presence of water ice. The ice was confirmed by the use of an instrument that can identify vapours; it was heated until it melted at 0°C (32°F), the melting point for water. 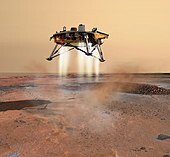 An artist’s rendition of the Phoenix Mars probe during landing. The original mission was planned to be funded for a 3 months, with the cutoff in late August. However, as a result of the probe’s good condition, NASA has stated that its stay will be extended by 5 weeks, till September 30. “Phoenix is healthy and the projections for solar power look good, so we want to take full advantage of having this resource in one of the most interesting locations on Mars,” said the Head of NASA’s Mars Exploration Program, Michael Meyers. An additional expense of US$2 million will be incurred because of the extension, on top of the US$420 million that has already been spent. This will allow for two more trenches to be dug, which will be dubbed as “Cupboard” and “Neverland”. The Phoenix probe landed on Mars on May 25 of this year near the north pole of Mars, where the ice was discovered. The ice was found in a trench approximately 5cm deep referred to as “Snow White”. “It’s been very successful and Mars had proven itself to be very interesting, mechanically the spacecraft is operating great, and there’s plenty of power margin to carry us beyond the waning summer,” said Meyers. The original goal of the mission was to determine if the red planet was capable of supporting life. Phoenix is in the process of performing experiments to determine if ice ever melted in Mars’ history. In addition it is searching for the organic-based compounds that are necessary for life forms to exist.